Following the 1971 release of Duck, You Sucker, Sergio Leone became fixated on the idea of adapting Harry Grey's mobster novel The Hoods into an epic movie about organised crime in the United States, a dream that finally emerged after 13 long years as Once Upon a Time in America. The challenges of getting that project off the ground consumed his career, but he managed to keep himself occupied during that long interregnum by turning himself into a producer and idea man. He also directed a small number of scenes for the first two films of his career as a producer, and it is to these that we shall now briefly turn. Like most Terence Hill vehicles in the early to mid '70s, My Name Is Nobody made a huge amount of money, leading Sergio Leone to come up with the idea for another Hill vehicle, A Genius, Two Partners and a Dupe, which while not technically a sequel was advertised to encourage confusion in that direction. Once again, Leone even directed the opening scene of the movie while handing the rest off to Damiano Damiani, director of the important 1966 Western A Bullet for the General. 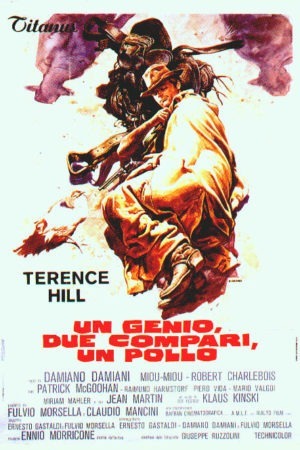 Unlike My Name Is Nobody, however, Leone did not apparently view this project as anything but a cash grab, and while debates spring up in spaghetti Western fandom about where exactly the authorship of the earlier film lies, it seems quite clear that his contributions to this one were minimal. Once again, the film is a broad, slapsticky comedy, and once again, Leone's contribution is a serious, intense scene that promises a gnarled web of intrigue and corruption: we learn of a sum of $300,000 and a shady gold mine and in the violent climax of this, a poor patsy is assassinated to keep his mouth shut - the shot of a volley of arrows being released in perfect unison is far and away the most indelible image in the feature, and all the proof we need that Leone, even when he wasn't trying very hard, had a natural instinct for what to do with the camera. Otherwise, though, the scene is awfully simple, and it could just as easily be a copy of Leone as the actual thing, a sign perhaps of how much the director/producer didn't care about the project. After all, if he'd cared, surely he'd have bothered to have an opening scene that gelled with the rest of the feature whatsoever. While My Name Is Nobody managed to generate thematic resonance from the conflict between Leone's solemn, dark scenes and Tonino Valerii's wacky scenes, A Genius, Two Partners, and a Dupe is saddled with an opening scene that, while impressive on its own, is such a tonal shift from the rest of the movie that it feels like something of a failure. The film itself is pretty wacky, all right, involving a complex but wholly insubstantial plot involving conman Joe Thanks (Hill) and his quest to steal that $300,000 from the racist Indian hunter Major Cabot (Patrick McGoohan). In this quest, Joe enlists the help of his blustering friend Steam Engine Bill (Robert Charlebois), a mixed-race fellow who loudly pronounces that there's not a drop of native blood in his body every chance he gets, and Bill's girlfriend Lucy (Miou-Miou, a French model and actress who was briefly quite popular in Continental films in the '70s). The two men have a friendly rivalry over the woman; for the most part, though, Joe is content to prove how much cleverer he is than Cabot and everyone else who crosses his bath, typically doing so in a goofy, comic way. I'll say this much: the film is breathtakingly shallow, but it's funnier than My Name Is Nobody, relying more on verbal barbs and less on potty humor - not that potty humor is banished, just that it is much reduced. And certainly as comedy goes, this is profoundly unsophisticated. Just as an example, Klaus Kinski makes a cameo appearance that he is visibly not happy with, and his final line in this cameo is "Aieee! My balls!" I will leave it to the reader's imagination as to how this transpires. Still and all, it's a breezy way to spend two hours: Hill is altogether affable, McGoohan does fantastic work as a vicious straight man to the Three Stooges-esque buffoonery around him, and Miou-Miou's screen presence is admirable, though she is saddled in the English dub with a horribly squeaky cartoon voice. It's a fairly disposable way for Leone to end his association in any capacity with the Western genre, but if you don't think of it that way, but as a trifling lark, it's not half bad, particularly given how threadbare the idea of even a slapstick Western had become by 1975.